This article was originally published in “Percussive Notes” magazine, Vol.30, No. 8, June, 1992. New opportunities for NEXUS, including a new major work for NEXUS by Toru Takemitsu, “From me flows what you call Time,” made it increasingly difficult for me to continue in what had been an ideal scenario – performing both with NEXUS and as Principal Percussionist in the Rochester Philharmonic Orchestra. The article was written as a kind of farewell to the orchestra after almost 30-years. The year 1922 was an important one in the cultural life of Rochester, New York. That was the year which witnessed the completion of the new Eastman Theatre and the formation of the Theatre’s resident orchestra. Both were the result of the efforts of one of America’s great industrialists and philanthropists, George Eastman, the founder of the Eastman Kodak Company. 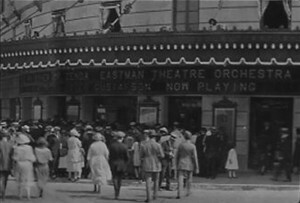 In 1918 Eastman had announced that he would build a new concert hall “surpassed by no other in the world.” He believed that a symphony orchestra could be “made a big factor in education,” and it was his intention to teach the people of Rochester to know and appreciate music in its best form by making it available to them in conjunction with motion pictures. The new Eastman Theatre was consequently designed to serve not only as a concert hall, but also as a place where opera and ballet could be presented, and where films could be shown. Movies in the 1920s were silent. Since there was no possibility of spoken words, normally the story would be presented in mime form with cue cards inserted into the film at various points to communicate the essence of the mimed dialog. A live musical accompaniment would then be performed as the movie was running to provide the crucial emotional background. In most of the movie theaters in America at that time, movies would be accompanied by a solo pianist or organist. Theaters in the larger communities might be able to support a small orchestra of from 12 to 20 instruments. Eastman’s vision was to have a full 70-piece symphony orchestra to perform the accompaniments, utilizing the world’s great symphonic music where possible. It was his hope that the constant exposure to this music in the movie theater would help to generate a real appreciation for music among the Rochester public. Once an audience for classical music had been developed, it would be necessary to present regular concerts. Therefore, the second part of Eastman’s plan was to have a series of classical music concerts performed by the resident orchestra of the new Eastman Theatre. In Rochester there were already a number of smaller orchestras performing in local theaters. Percussionists in those orchestras would not only play the written parts in the small orchestra transcriptions and film accompaniments, but they would also provide the sound effects for silent films as needed. The word got around town quickly that a new orchestra would be forming in the Eastman Theatre, and virtually all of the local musicians were interested in applying for a position. Eastman wanted only the finest musicians, however, and when the openings were filled, there were three percussionists in the new Eastman Theatre Orchestra – George Waterhouse was the timpanist, and William G. Street and Harry Waterhouse (George’s cousin) would form the percussion section, with Street as Principal Percussionist. A) The Eastman Theatre Orchestra – This was the name of the core orchestra from 1922 to 1929. Its size varied from 65 to 70 musicians. B) The Rochester Civic Orchestra – This was the name of the core orchestra from 1929 until about 1964. Its size varied from 45 to 55 musicians. This was the orchestra that not only survived, but grew during the Great Depression. C) The Core Orchestra – This term was used from about 1964 to the present. D) The Rochester Philharmonic Core Orchestra – This name was also used from about 1964 to the present. E) The Rochester Philharmonic Orchestra – This name was used from 1922 to the present to denote an augmented orchestra (of about 10 to 25 added part-time professional musicians) performing a strictly classical repertoire. After 1975 this name applied to both the core orchestra and the augmented orchestra. F) The Eastman-Rochester Orchestra – This name was used in the 1940s and 1950s to denote an augmented orchestra (usually with faculty and/or students from the Eastman School and/or part time professionals) for phonograph recordings which were mostly financed by the Eastman School of Music. G) The Rochester Pops Orchestra – This name has been used throughout the orchestra’s history to denote an augmented orchestra (usually with 5 to 15 added part-time professional musicians, frequently with a popular music or jazz background) and performing lighter programs. The name has also been used on recordings of lighter music. H) The Rochester Little Symphony – This name was used from the 1920s to the 1950s for an ensemble smaller than the core orchestra (usually consisting mainly of principal chair players) performing chamber music or classical-period orchestral repertoire. I) The Rochester Philharmonic Chamber Players – This was used in the 1970s to denote a chamber ensemble of from 15 to 35 members of the core orchestra. J) The McCurdy Symphony – This name was used from the 1940s to the 1960s to denote the core orchestra on radio broadcasts financed by McCurdy’s Department Store in Rochester. Confusion about the relationship between the Rochester Philharmonic Orchestra and the Eastman School of Music can be addressed by stating that from the very beginning, the Philharmonic Orchestra has been a separate organization from the Eastman School, both administratively and financially, although there have certainly been areas of shared purpose and cooperation throughout the history of both institutions. Both were organized by George Eastman to serve the general musical education of the community, but with differing missions: one institution to “maintain an orchestra which shall conduct concerts of an educational character” and to “conduct public programs”, and the other to “conduct courses leading to the degree Bachelor of Music” or “the Eastman School Certificate”, and “a preparatory course preparing students for entrance to its degree and certificate courses.” In other words, the primary educational purpose of the orchestra was to train listeners while that of the Eastman School was to train professional musicians. This program was typical of an era of eclectic programming, particularly in the Eastman Theatre over the next decade. The silent film would only be a single part of a larger presentation which included concert pieces, ballet, opera scenes, instrumental and vocal solos, and even theatrical skits. The programs would run for an entire week, with two performances a day and with the orchestra resting on one day while the Theatre’s organist stepped in to accompany the film. From the very beginning, the percussion section was required to show great versatility, with each performer having the ability to perform with finesse on all of the percussion instruments in the classical repertoire, as well as to have an understanding of popular styles for the lighter music, and imagination in providing sound effects for silent films. This versatility would remain as a requirement of necessity throughout the orchestra’s history, and at least in this one regard, the percussion positions differed from those in most of the other symphony orchestras, which for the most part devoted their programming to “serious” music only. 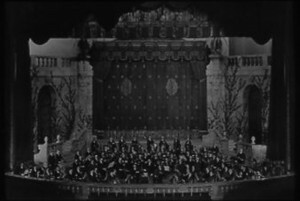 For the film accompaniments, the percussion section of the Eastman Theatre Orchestra maintained a variety of acoustic sound effects instruments, such as a mechanical wind machine and a huge (4 ft. x 5 ft.) “thunder drum” with a thick animal hide tacked to its rectangular frame. The inclusion of the Victor Herbert work is noteworthy in that much of the Philharmonic’s programming – as already noted in the case of the Eastman Theatre Orchestra – was somewhat eclectic until well into the 1940s. In contrast to the more serious tastes of the post-WW II audiences, it would not be unusual in the early days of the Philharmonic for programs to contain say, only one movement of a symphony or perhaps a popular light classical work or opera excerpt. 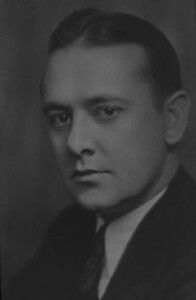 Within a few weeks of the first Philharmonic concert, Albert Coates and Eugene Goossens, both Englishmen, were appointed as co-directors of music. 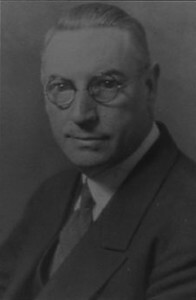 Coates stayed only until the end of the 1924-25 season at which time Eugene Goossens was appointed as the permanent music director. Over the next few years – until 1929 or so – the programming of the Eastman Theatre Orchestra made it possible for many members of the orchestra to perform solo works. The first such occasion featuring percussion was during the week of July 6, 1924. For the entire week, two xylophone solos appeared in the program performed by William Street. The pieces were “Liebesfreud” by Fritz Kreisler and “Oh, Baby”-Fox Trot by Donaldson. Of course, the xylophone had been a popular solo instrument in vaudeville for years, so its use in the environment of the Eastman Theatre was both natural and successful with Eastman Theatre audiences. The Theatre Orchestra also provided opportunities for small ensemble performances. During the week of January 4, 1925 a group of musicians from the Eastman Theatre Orchestra – including William G. Street on percussion – performed four pieces as the “Concert Jazz Ensemble.” The ensemble was so well received that it continued to appear on Theatre programs for several seasons. Also that same season the “Eastman Theatre Jazz Trio” – comprised of piano, saxophone, and William Street on xylophone – made its debut in the Theatre. This instrumentation was likely influenced by the “All Star Trio” in which George Hamilton Green performed as xylophonist, and which had become enormously popular as a result of their Victor recordings in the early 1920s. • week of September 6, 1925 -”Phantom Fantasy” by H. A. Bower and “Don’t Bring Lulu” by Henderson, featuring William Street, xylophone. • week of February 21, 1926 -”Strolling Along Hawaiian Shores” by Machan and “Remember” by Berlin, featuring William and Stanley Street, marimba duo. • week of April 4, 1926 -”Indian Love Call” by Friml – marimba duet, “Song of India” by Rimsky-Korsakov – vibraphone and marimba duet, and “Russian Rag” – xylophone duet by Klickman featuring William and Stanley Street. • week of July 4, 1926 -”Liebesfreud” by Kreisler and “Then I’ll Be Happy” by Brown, William Street, xylophone soloist. • week of February 4, 1928 -”Dolly Dimples” by Alter and “The Bells of St. Mary”, xylophone and vibraphone duets featuring William and Stanley Street. • week of June 16, 1928 -”The World Is Waiting for the Sunrise” by Seitz, featuring William Street, xylophone. On the classical side, the Philharmonic concert series, under the musical direction of Eugene Goossens, covered a wide repertoire during the 1920s including works by Berlioz, Elgar, Eugene Goossens, Howard Hanson (the director of the Eastman School of Music), MacDowell, Rachmaninoff, Respighi, Rimsky-Korsakov, Scriabine, Sibelius, Sowerby, Stravinsky, Tschaikowsky, Wagner, Vaughan Williams, and many more. In addition, on May 1, 1925 a concert featuring works by American composers and conducted by Howard Hanson was presented. This program was to be the forerunner of the Festival of American Music in which the core orchestra of the Rochester Philharmonic participated from 1931 to 1970. This Festival frequently presented new works which were heavily scored for percussion.